Activity of modern scholarship creates online footprints galore. Along with traditional metrics of research quality, such as citation counts, online images of researchers and institutions increasingly matter in evaluating academic impact, decisions about grant allocation, and promotion. We examined 400 biographical Wikipedia articles on academics from four scientific fields to test if being featured in the world’s largest online encyclopedia is correlated with higher academic notability (assessed through citation counts). We found no statistically significant correlation between Wikipedia articles metrics (length, number of edits, number of incoming links from other articles, etc.) and academic notability of the mentioned researchers. We also did not find any evidence that the scientists with better WP representation are necessarily more prominent in their fields. In addition, we inspected the Wikipedia coverage of notable scientists sampled from Thomson Reuters list of ‘highly cited researchers’. In each of the examined fields, Wikipedia failed in covering notable scholars properly. Both findings imply that Wikipedia might be producing an inaccurate image of academics on the front end of science. By shedding light on how public perception of academic progress is formed, this study alerts that a subjective element might have been introduced into the hitherto structured system of academic evaluation. Modern scholarship is undergoing a revolutionary process of transformation triggered by the advances in information and communication technology. In growing numbers, scholars are moving their everyday work to the Web, creating diverse digital footprints galore. Recent studies show that social media have become indispensable in supporting research related activities [1, 2]. According to an analysis of STI conference presenters, 84% of scholars have web pages, 70% are on LinkedIn, 23% have public Google Scholar profiles, and 16% are on Twitter. Online reputation management is becoming essential in academic circles : 77% of researchers monitor their personal online images, and 88% guard the reputation of their work online . Researchers are advised to establish a Web presence on social media websites such as Twitter and Google+ so that they appear higher in the search results and thereby become more visible . These developments in the research enterprise, affect both formal (among scholars) and informal (with the wider public) scholarly communication [6, 7], and create new possibilities as well as challenges, in the evaluation of the contribution of the individual researchers and the scholarly progress in general [8, 9]. Modern research communities are under increasing pressure to justify their scientific and societal value to the general public, funding agencies, and other stakeholders, and online presence plays an important role in this competitive race . These days citation analysis, which involves counting how many times a paper or a researcher is referred to by other researchers, along with analyzing authors’ citation networks, is increasingly used to quantify the importance of scientists across the disciplines . Direct citation counts and their functions like h-index  and g-index  are widely employed for scientific impact evaluation and measuring researchers’ visibility . They can be of fundamental importance in decisions about hiring  and grant awards , and often are the only way for non-specialists from different fields or non-academic institutions to judge the impact of a scientific publication or a scholar . Although citation counts are universally acknowledged as the indicator of academic prestige, they are loosely correlated with the future scientific impact of scientists . Previous research admits their biases associated with (1) negative or ceremonial citations , (2) geographical gravity laws in citation practices , (3) incomparability of citation counts across fields  and bibliographical databases [13, 18–20]. Finally, subject to delays caused by publishing and peer review procedures, citation counts accumulate slowly and lag behind by several years. Along with citation counts, public engagement is another factor essential for scientists’ future funding, promotions, and academic visibility [5, 21]. Increasingly often, this engagement is happening online through different social media, and can be measured with the number of ‘likes’, clicks, comments, downloads, ‘retweets’, etc., which have been labeled altmetrics (alternative metrics) . There is a wide scope of ongoing research exploring the role of social media and altmetrics in providing alternatives to the traditional research evaluation [3, 23, 24], primarily, exploring how much altmetrics data exist  and whether they can be used in evaluating academic impact . For example, a recent study has found that earlier article  download metrics can be used for predicting the future impact of academic papers, and some researchers even suggest that academics should include altmetrics in their CVs  as an innovative indicator of academic importance. In this study, our attention was drawn by Wikipedia, a web-based encyclopedia which allows any user to freely edit its content, create and discuss the articles - all in the absence of central authority or stable membership. This model of a decentralised bottom-up knowledge construction draws on the wisdom of the crowds rather than on professional writers and peer-reviewed material, which makes Wikipedia similar to a social media platform. Unlike other encyclopedias, Wikipedia is unrestricted in size and range of topics covered, and thereby holds the potential to become the most comprehensive repository of human knowledge. Although many studies have raised concerns about reliability and accuracy of Wikipedia content [27–29] for many people, not excluding scientists, Wikipedia is the first port of call for quick superficial information search: 29.6% of academics prefer Wikipedia to online library catalogues , and 52% of students are frequent Wikipedia users, even if the instructor advised against it . In general, browsing Wikipedia is the third most popular online activity, after watching YouTube videos and engaging into social networking: it attracts 62% of Internet users under 30 . The popularity of Wikipedia seems to be facilitated by the Google search engine itself. A recent study has found that in 96% of cases Wikipedia ranks within the top 5 UK Google search results , which means that Wikipedia content becomes (1) highly visible, taking a direct part in shaping public opinion on a variety of topics, and (2) virtually unavoidable, whether the user was searching for it or not. In the present study, we wanted to investigate how the academia itself is represented on Wikipedia. Previous research suggests that editing Wikipedia can be an influential way of improving researchers’ visibility or getting the message across, even in academic community . Although there has not been sufficient research on exactly what it means if a scholar has a Wikipedia page, it is considered prestigious to have one. According to an online survey conducted by Nature, nearly 3% of scholars have edited their Wikipedia biographies, and about 25% check Wikipedia for references to themselves or their work . The decisions on the inclusion/deletion of the articles in the encyclopedia are adopted through the consensus among the editors, rather than imposed by a controlling institution. The articles need to satisfy some notability criteria in order to be deemed worthy of inclusion, and in most cases are speedily deleted if the community of editors deems them irrelevant . Previous research has demonstrated that the topical coverage of Wikipedia is driven by the interests of its users, and its comprehensiveness is likely to vary depending on the topic . Moreover, the cultural preferences of the community of Wikipedia editors introduce additional subjectivity in the editorial process of the encyclopedia . A few studies have examined Wikipedia coverage of academically related topics. Elvebakk compared Wikipedia coverage of 20th century philosophers with two peer-reviewed Web encyclopedias and concluded that through the inclusion of ‘minor’ and amateur philosophers, Wikipedia gives a messier, more dynamic picture of the field, which, however, is not fundamentally different from more traditional sources, but shows a slight tendency to a more ‘popular’ understanding of the discipline . Another qualitative evaluation of Wikipedia was done by the experts in Communication studies who examined the encyclopaedia’s articles on communication research and revealed that Wikipedia is missing the contemporary research and offers an incomplete and faulty impression on the current state of communication studies . To the best of our knowledge, the only quantitative study that examined Wikipedia in academic context argues that among Computer Science related topics and authors, those ones mentioned in the encyclopedia are more likely to have higher academic and societal impact . Yet, we see some fallacies in these results obtained by Jiang et al. Firstly, the reported Spearman correlation coefficient between academic and Wikipedia ranking of authors is close to zero, which implies very low tendency for one to predict the other. Secondly, their selection of authors is limited to those Computer Scientists mentioned in the ACM Digital Library papers, which makes generalising the findings to other fields and academia as a whole impossible. Lastly, the problem of name ambiguity was not addressed in the study. Overall, the existing research is based on small samples limited to one discipline, and offers a fragmented view of Wikipedia coverage of academic topics. This does not allow drawing holistic conclusions about the role of the encyclopedia in both formal and informal academic communication. To further investigate this matter, we examined 400 biographical Wikipedia articles on living academics from the fields of (1) Biology, (2) Physics, (3) Computer Science, (4) Psychology and Psychiatry. The articles differed in comprehensiveness and structure of contents, but generally included researchers’ short biography and sections covering their personal and public life, research activities, scientific contributions, affiliation with institutions, awards, etc. We tested the correlation between such parameters of the Wikipedia articles as length, number of views, editors, edits, etc., and citation indexes of the academics, such as total number of publications, total number of citations, h-index, etc. retrieved from the bibliographical database Scopus. The analysis of the data allowed us to identify whether the researchers featured on Wikipedia have high academic notability in their fields. To complete the picture, we also examined the Wikipedia coverage of scientists introduced as ‘influential’ by Thomson Reuters, a world leading expert in bibliometrics and citation analyses. Out of 400 randomly selected English Wikipedia articles on researchers (see Methods), 91% of scholars were academically active and had Scopus profiles (87 Biologists, 94 Computer Scientists, 98 Physicists, and 86 Psychologists and Psychiatrists). Of the remaining 9% with no Scopus record of publications, all had some relevant academic experience; namely, 34% changed occupation after completing their degrees; 31% contribute to popularising science in their fields; 29% are active academics, and 6% have retired. The field-specific average Scopus metrics are summarised in Table 1. On average, biologists in the sample are the most prolific authors, accumulating the highest number of citations per document, total citations, and h-indexes. Computer Scientists have the fewest average citations per document and demonstrate the lowest h-indexes in the sample. Psychologists and Psychiatrists scholars on average have longest careers and collaborate with fewer co-authors than researchers from other fields, generally producing the smallest number of documents. 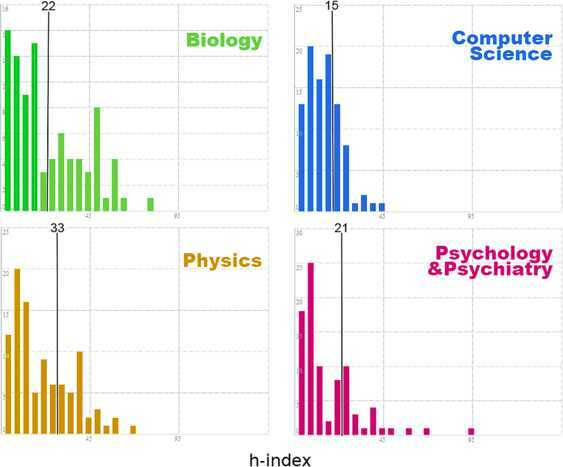 The last column shows the proportion of researchers in the sample whose h-index was above the field average (field-specific averages of h-indexes were taken from previous research [10, 39]). The numbers in parentheses are the standard errors of the average. We compared the h-indexes of researchers from the Wikipedia samples who have Scopus profiles with the overall average h-indexes by field established in previous research [10, 39]. The researchers, whose h-index was higher than the field average, were considered notable. Figure 1 demonstrates the histograms of h-indexes in the observed fields and their distribution in relation to the field-specific average h-indexes. The analysis has shown that only a small percentage of researchers mentioned on Wikipedia (36% of Biologists, 31% of Computer Scientists, 24% Psychologists and Psychiatrists, and 22% Physicists) are notable according to the traditional means of evaluation (citation indexes). Table 2 summarises the averages of Wikipedia articles metrics, and reveals field-specific differences in the appearance and popularity of the articles. The articles on Physicists have the most diverse coverage in other language editions of Wikipedia, are the longest in the sample, and on average attract the largest number of unique editors and edits, which suggests a heightened interest of Wikipedians in covering this topic. 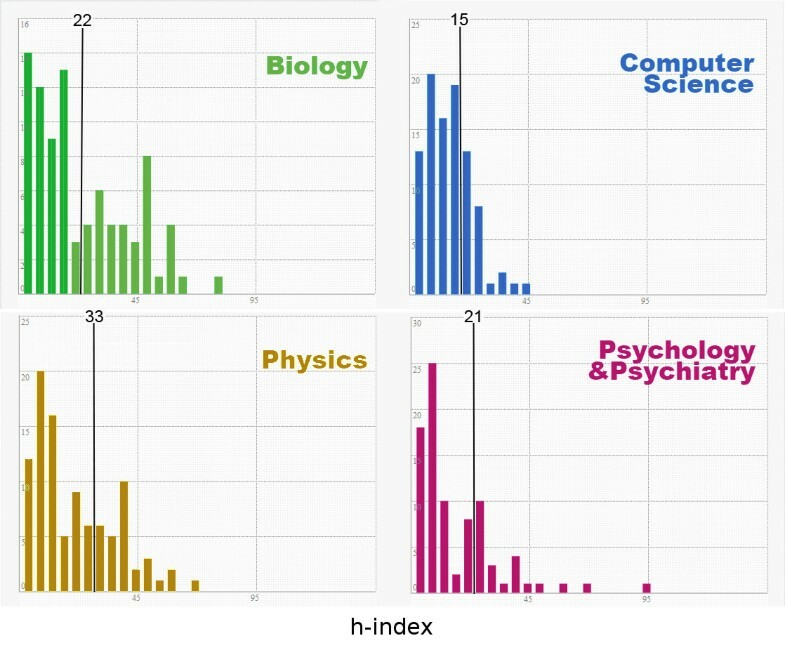 The articles on Computer Scientists, despite being the shortest, have the highest in-degree and thus, are most connected with other Wikipedia articles. The articles on Psychologists and Psychiatrists are on average the most viewed ones. Histograms of the h -indexes of the authors in the Wikipedia samples. The black line indicates the average h-index in the field taken from the previous research <abbrgrp>1039</abbrgrp>. The length of a page is taken as 2,638 characters (a standard A4 Word document, Arial 12, 1.5 spaced). Languages column includes the number of language editions of Wikipedia covering the same scholar (excluding English). The numbers in parentheses are the standard errors of the average. For all scholars with Scopus IDs, we examined 6 × 8 binary permutations of Scopus and Wikipedia metrics (presented in Tables 1 and 2), and performed regression analysis in logarithmic space. All the calculated correlation coefficients are presented in Additional file 1, Table A1. Although we tried to consider all the potentially correlated pairs of parameters, to make sure that we do not miss any aspect of relation, but we discovered no significant correlation between any of the pairs. 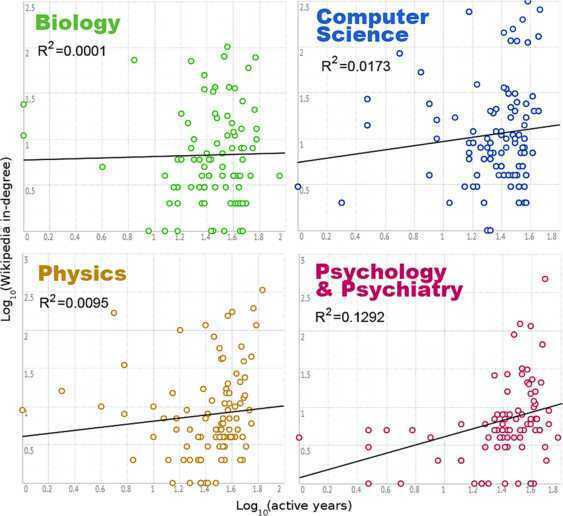 The strongest positive correlation ( R 2 = 0.13 ) in the dataset was found between in-degree (Wikipedia) and years active (Scopus) pair of variables in Psychologists and Psychiatrists subset (shown in Figure 2). 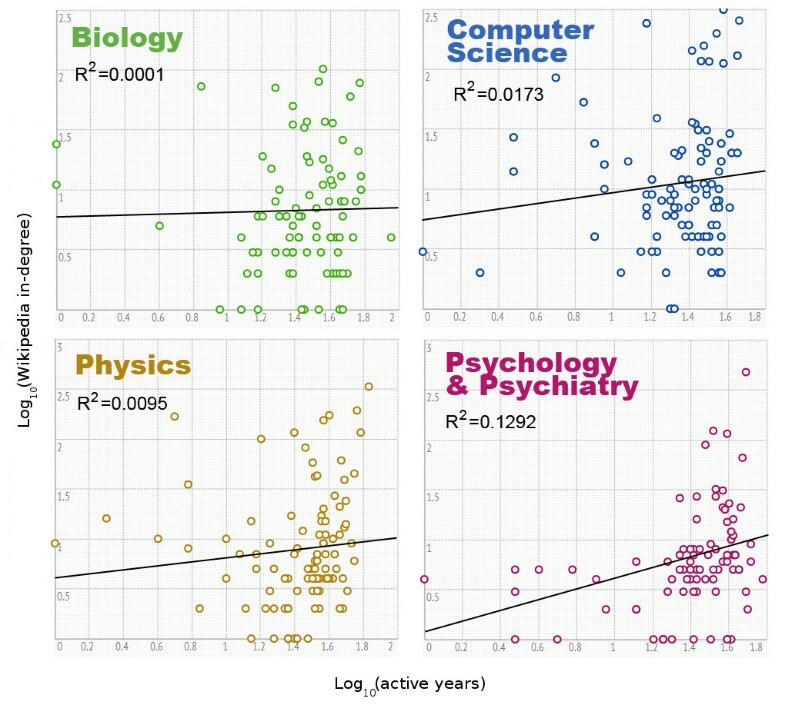 The strongest positive correlations in other subsets included the following pairs: number of language editions (Wikipedia) vs. years active (Scopus) in Biologists ( R 2 = 0.019 ), in-degree (Wikipedia) vs. mean citations (Scopus) in Computer Scientists ( R 2 = 0.023 ), and number of languages editions (Wikipedia) vs. mean citations (Scopus) in Physics ( R 2 = 0.035 ). Scatterplots of the Wikipedia in-degree of the articles vs. the number of active years. The solid line shows the best linear fit (using the least squares algorithm) to the data in log-log scale. The strongest positive correlation is found in the Psychologists and Psychiatrists subset ( R 2 = 0.1292 ). To investigate the coverage of the prominent researchers by Wikipedia, we also analysed a random sample of 219 academics selected from the Thomson Reuters list of 1317 people ‘behind the world’s most influential research’ . The results demonstrated that Wikipedia left out 52% of the most prominent Computer Scientists, 62% of the most influential Psychologists and Psychiatrists, as well as 67% of Biologists and Biochemists. The poorest coverage was observed in Physics: 78% were not found on Wikipedia. Importantly, the list of highly cited researchers was published in 2010, whereas our data describe the current state of Wikipedia, having left sufficient time to Wikipedia editors for a proper inclusion of the listed prominent scientists. Despite this, Wikipedia has no record of the majority of the examined scientists regardless of their field. In order to measure the overall performance of Wikipedia in representing the notable scholars, we calculated the F-scores for each of the examined fields (Table 3). F-score is a measure of a classification accuracy based on the harmonic mean of precision (the proportion of retrieved instances that are relevant, in this case the ratio of researchers on Wikipedia with h-index above field average) and recall (the proportion of relevant instances that are retrieved, in this case the percentage of Highly Cited researchers covered by Wikipedia); F = 2 × precision × recall precision + recall . Precision is the ratio of researchers on Wikipedia with h-index above field average and recall is the percentage of Highly Cited researchers covered by Wikipedia. F-score is the harmonic mean of these two. shows a perfect match between the model and the data, and a null model of random assignment leads to F = 0.5 . Table 3 shows that in each of the four inspected fields, the F-scores were below the accuracy of a random assignment. In other words, Wikipedia failed in both of the examined dimensions: being on Wikipedia does not signify academic notability, and being notable does not guarantee Wikipedia coverage. Surprisingly, smaller categories sometimes demonstrated higher recall than the bigger categories, which indicates that the growth of categories in terms of the number of articles, does not necessarily lead to a more inclusive coverage. Wikipedia notability guidelines for academics suggest that the encyclopedia should only cover the researchers who have ‘made significant impact in their disciplines’, which ‘in most cases’ is associated with being ‘an author of highly cited academic work’ . Consequently, in the eyes of a lay user, the mere presence of a scientist on Wikipedia is associated with their academic prestige and authority. However, we observed that, contrary to the expectations, the majority of the researchers’ biographies on Wikipedia do not meet the primary notability criteria and thus, their inclusion in the encyclopedia can be deceiving. Previous qualitative examination of Wikipedia articles on certain academics  and fields  suggested that the selection of authors and topics by academic community differs from the one suggested by the community of Wikipedians. Our findings show that this claim can be extended to a wider scope of fields and authors, establishing that Wikipedia offers a very different image of researchers on the front end of the scientific progress. Our findings suggest that the inspection of Wikipedia is not useful in finding highly cited researchers. Moreover, counter intuitively we observed that in some cases, the articles on authors without a Scopus track of scientific publications were longer and attracted more editors than the articles on the scientists with high citation indexes. This implies that the decisions of WP editors about covering certain scholars were motivated by the reasons other than the prominence of those scholars’ bibliographic records. Moreover, Wikipedia metrics of the articles about the prominent researchers (with high h-indexes) were not statistically larger than the same metrics from the less cited subset (Welch’s t-test did not reject the null hypothesis of identical distributions; the smallest p-value among all metrics and disciplines was 0.18). Consequently, we establish that for a non-professional reader who turns to Wikipedia with an exploratory purpose of finding some prominent researchers in a field, the encyclopedia might be misleading, as it provides no reliable visual cues that might be a proxy of academic notability. We conclude that the absence of correlation between Scopus and Wikipedia metrics suggests that they measure different phenomena. As such, unlike other social media like Twitter and Facebook , Wikipedia cannot be used as an early indicator of academic impact. That comes as a surprise, especially considering that previous research has shown that Wikipedia activity data is a better predictor of financial success of movies than Twitter . Yet, openness, speed, diversity, and collaborative filtering offered by Wikipedia, can be applied to measure other aspects of scientific impact that are not captured by the traditional citation analysis, for example social impact  or public engagement of a scientist. We also investigated which proportion of truly prominent scientists (according to the ISI Highly Cited Research list of most notable scientists) have Wikipedia presence, and discovered that the coverage is below 50% in each of the four examined fields. Since the list has been publically available since 2010, this observation cannot be due to time constraints. We know from previous research that Wikipedia topical coverage is uneven and driven purely by the interests of its editors community . Our findings establish that academic prominence of researchers (measured by citation counts) is not among the factors facilitating the decisions on articles inclusion. Instead, the interest of Wikipedians might be driven by other factors like scientists’ social impact, public outreach, attention from media, popularity of their research topic, etc. Interestingly, we observe that the academics with very low h-indexes and high Wikipedia visibility (measured in gained views) are all noted figures, book authors, and popularisers of science. This democratising effect of Wikipedia and Web 2.0 gives young and promising academics more chance to be seen and found. On the other hand, it introduces a subjective element into the hitherto structured and well-established system of peer-review-based academic evaluation. Despite Wikipedia’s inconsistency with the traditional view of scientific impact, its content is highly visible and virtually unavoidable. The encyclopedia is making its way into society, playing a role in forming public image on a variety of issues, not excluding science; and this rise of Wikipedia is difficult to ignore. As the articles are being actively edited and viewed, individual scientists, their fields, and entire academic institutions, can be easily affected by the way they are represented in this important online medium. One of the limitations of the present study relates to the inherent characteristics of bibliographical database Scopus. Its citation metrics are restricted to the pool of 12,850 reviewed journals and do not cover any publications before 1966 . This study only scrutinises one aspect of scholarly notability - the citation metrics. Future studies might focus on testing whether other aspects - for example, prestigious academic awards, membership in highly selective scholarly societies, the impact of the work in the area of higher education and outside academia - raise the likelihood of being included into Wikipedia. It could be instructive to qualitatively study the talk pages of Wikipedia articles on academics in order to understand the motives for the inclusion/deletion of the articles, and examine how the editors perceive the notability of the scientists covered. Future work can also scrutinise if the presence on Wikipedia serves as a proxy to academics’ social impact or public visibility. And more importantly: Who is writing Wikipedia articles on academics (lay users, academics, or the subjects of the article and their immediate social surroundings)? What motivates their selection choices? How do the readers perceive the articles on academics? More research is also needed to understand how the online image of scientists affects their reputation offline, as well as the decisions regarding funding, conference invitations, grant allocation, collaboration, and promotion. And specifically, what role does Wikipedia play in shaping this online image? We used English Wikipedia’s internal category tree structure to retrieve the full lists of articles in the following categories: Biologists (81,631 articles), Physicists (4,554 articles), Computer Scientists (13,789 articles), Psychologists and Psychiatrists (4,777 articles). From each of the lists, we took a random sample of 300 entries and manually selected the first 100 articles that met the following criteria: (1) the researcher was alive at the moment of data collection; (2) the article page had no warning of a problem with Wikipedia notability guidelines for biographies; (3) the content of the article and the assigned category suggested the same field affiliation. This left us with a dataset of 400 articles. The article metrics were collected using SQL access to Wikimedia Toolserver database and included: page ID, number of unique editors and edits, number of editors and edits excluding those made by bots (‘bot’ is a piece of code that runs through Wikipedia to implement minor edits and other repetitive operations that help maintain the quality of Wikipedia articles ), length, in-degree (in this case, in-degree refers to the number of Wikipedia articles linking to the selected article), number of page views, and number of other language editions of Wikipedia in which the article was covered. We searched the academics from the 400 selected Wikipedia articles in Scopus bibliographical database, and in cases where they were available, collected the following citation metrics: author ID; number of documents, citations, co-authors, and years active; h-index, and mean citations per paper. The data were collected and verified manually in order to exclude the name ambiguity problem. In cases when the same researcher had two profiles, the citation data were taken from the profile with most citations. The complete datasets are available online in Additional file 2, Dataset A1. To identify the researchers behind the most fundamental contributions to the advancement of science, we used the data from the ISI Highly Cited Research study by Thomson Reuters . The study is based on the top cited publications covered in Web of Science from 1981-2008, and is freely available online. We downloaded the list of the prominent researchers in each of the four relevant fields (sampling frames) from http://highlycited.com/ website. The entries were arranged alphabetically and consisted of researcher’s name, surname, and organization. From each of the sampling frames, we extracted every sixth entry and obtained four systematic random samples: Biology and Biochemistry (49 researchers); Computer Science (63 researchers); Physics (54 researchers); Psychology and Psychiatry (53 researchers). Then each author was searched in Wikipedia to check whether there was a corresponding article. All data were collected in August 2013. The list of ‘prominent researchers’ is available online in Additional file 3, Dataset A2. The data were imported into MATLAB to test the possible correlations between Wikipedia and Scopus statistics. Histograms of all variables were visually inspected for normality and the data were logarithmically transformed to compensate for the skewness of the data distribution. We built a linear regression model and calculated the coefficient of determination R 2 to measure the strength of association between all possible permutations of variables. The researchers with no Scopus IDs were examined as separate cases. We would like to thank Ralph Schroeder, Eric T. Meyer (University of Oxford), Jasleen Kaur, and Filippo Radicchi (Indiana University) for insightful discussions. We also thank Wikimedia Deutchland e.V. and Wikimedia Foundation for the live access to the Wikipedia data via Toolserver. AS and TY conceived and designed the research; AS analysed the data and wrote the main manuscript text. All authors reviewed the manuscript.